Many works of English literature deal with the theme of personal identity. Shakespearean characters (particularly Viola from Twelfth Night) are known to play with our preconceived notions of who we think we are. Needless to say, fretting about whether or not you are part of “infinite consciousness,” or are otherwise “awakened” is really diversionary; I suggest that it is much more beneficial to quit worrying about such esoteric matters and simply enjoy impersonating archetypes with whatever creative genius you happen to naturally possess. Disguise is not primarily physical, but psychological. The author stresses the importance of “not-being,” that is, the feeling of not wanting to be noticed, much like not wanting to be called on in school or attempting to avoid human contact on a bus. By additionally assuming the characteristics of certain stereotypes, you can blend seamlessly into an environment than you would otherwise be able to naturally (such as by appearing to be a college student, waiter, or mailman/deliveryman); of course, the yin to this yang is that you can also “hide in plain sight” by acting like a highly visible archetype (i.e. priest, prostitute, police officer, etc). The key to a truly good impersonation is to choose a stereotype that is very, very different from how you naturally behave. Increasing observational skills is an essential preparatory task for training in the art of disguise. Jotting down notes about the appearance of people in photographs can help illuminate you in terms of what your natural prejudices are, with the preferable goal of helping you develop an objective perspective. Interestingly, studying television shows and movies in a focused manner can demonstrate to you why your impressions of certain characters are what they happen to be due to a combination of personal appearance and carefully crafted behavior. These practice sessions can be upgraded towards observing your own behavior by recording yourself on video and then studying your own behavior and appearance. Simple disguises are wonderful for being able to be easily throw away as outfit components as well as also being able to quickly change into other ones. Certain aspects of the environment, such as your car or office, can also be pressed into service in terms of deceiving your targets. Awareness of how you act in given contexts, coupled with your conscious manipulation of it, can greatly aid you in your efforts. Authentic previous experience with a certain social group is essential to infiltrating it. Letting others make assumptions based on what you omit is an immensely powerful technique; what you can’t let be assumed by your targets, you should be able to weasel your way through without appearing to do so. Permanent disguises require many identification papers that have to be painstakingly acquired. Physical disguises should be as generic and as easy to use as possible. Cosmetics, hair styles, and artificial age lines should not be completely ignored when assembling the actual outfit. Removing unsightly chest hair and/or adding a wig should not be overlooked. Brushing on naturally appearing bruises, tattoos, or scars are some choices available to you. Present also is the option to suntan. 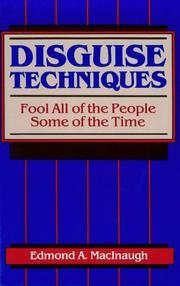 Edmond MacInaugh’s Disguise Techniques: Fool All of the People Some of the Time is a must read since it presents what can be done for your own amusement, or, for some reason, deception is unavoidably necessary. Political dissidents who are prone to commit civil disobedience blatantly might very well become much more discreet when they realize that when the State puts them on their databases as troublemakers of some sort, what would then be needed to avoid detection could be considered by them to not be worth the effort in the first place. Alternatively, those who understand the field of military science can appreciate the utility of being able to blend in seamlessly within the population.